It is believed that Bernard Cook had the Garage built on the site of an orchard in 1938. During the Second World War, shortly after trade began, the army occupied the garage. In 1947, Bernard was allowed to continue his business, later trading as a Ford dealership. 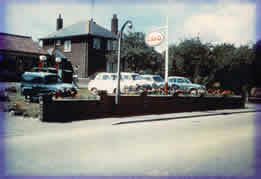 The photo shows the garage in 1962. The Garage changed hands around 1983, trading as Mountview Motors, specialising in the sale of TVR's and Lancia's. 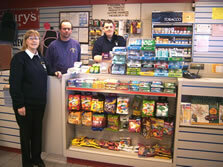 The current owner Richard Dear grew up in the motor trade, his parents having owned a garage in Sleaford since 1968. On leaving school he became an apprentice mechanic, but after a few years, he realised his flare was in car bodywork. His profession was in panel beating, having worked at Mercedes, Vauxhall and Mazda dealerships and a MG specialist in Morton near Bourne. In 1991 Richard and his wife Kim set up a business selling used cars from a rented site in Sleaford and this proved so successful, that in 1995 they decided to purchase Mountview Garage in Horncastle. They sold their house in Ewerby and moved with their family to Horncastle. Since purchasing the Garage they have carried out extensive alterations to make it what it is today, a friendly family business, offering an extensive variety of services. Richard is a keen vintage and classic motorcycle enthusiast and enjoys restoring them. He has his own personal collection. In 2008 we carried out a workshop extension consisting of two modern work bays and facilities to test class 7, which includes ups to 3.5T and motorhomes.